A famous modernist home in Palm Springs designed by John Lautner, known by many for its brief appearance in a Bond film, has recently been re-listed, quickly drawing attention and offers. The one-of-a-kind dwelling, which hasn’t been open to the public for years, returns to the market after a lengthy legal battle and is asking $8M, according to The Desert Sun. Real estate investor Michael Kilroy purchased the Elrod Home, as well as two other properties (the Steve McQueen House and Boat House), for $11 million. Years later, Kilroy fell on hard times and in 2012, UK-based lender Lloyds Bank sued Kilroy, claiming he had stopped payment and owed $1.8 million. In addition, the nearby Southbridge Property Owners Association also sued, claiming Kilroy owed $150,000 in fees. Last April, Kilroy filed a petition for bankruptcy, and the creditors agreed he had until the end of 2016 to sell. Last week, local broker Nelson Moe Properties listed the home. Designed for a noted interior designer and considered a key example of Lautner’s exemplary means of blending architecture and nature, the Elrod House is one of the most famous Modernist homes in Palm Springs. Highlights of the home's layout include a circular concrete canopy framed by glass windows and a projecting pool deck that seems to float above the landscape. 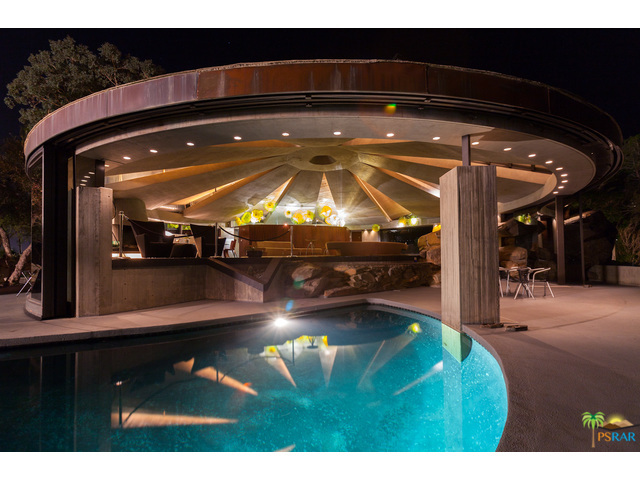 This isn’t the only John Lautner-designed home to be in the news this year. In February, it was announced that his famous, dramatically slanted Sheats-Goldstein Residence, which made a cameo in The Big Lewbowski, was donated to the Los Angeles County Museum of Art (LACMA). Thank you Patirck Sisson with L.A. Curbed http://www.curbed.com/authors/patrick-sisson for including our iconic famous high end real estate home as one of your articles!